In 1970, serving in Vietnam, I had transferred from the 199th Light Infantry Brigade based at Long Binh, for extended tour of duty with the 330th Transportation Company located at Vung Tau. The US Army Airfield at Vung Tau was an advanced aircraft maintenance location, primarily, with a runway that could handle freight aircraft up to a C-130. By far, however, it was mainly a service center for helicopters needing advanced repairs, engine overhauls, rotor replacements, et cetera. Among other tasks, I worked airfield perimeter and flight line security. We had fully armed Cobra gun ships for airfield protection that needed secured from possible sapper attack, particularly, as well as the more typical security needs. The period was from October of 1970 to November of 1971. As an E-5, I had responsibility for men on the perimeter at times, at other times on the flight line. Perimeter duty in my sector was parallel to the landing and take off (main) runway. This was Vietnam approaching late stage conflict. Heroin addiction was estimated by myself and other non-commissioned officers to be about 30% of the US Forces enlisted men on this airfield. Our own company and it’s platoons were about this average level of addicts as was our understanding this being the similar case of the other Army units located there. Again and again, over this 13 month period, heroin ran out. It could not be missed when nearly a third our soldiers at Vung Tau, a few hundreds of men, went into physical and mental symptom of withdrawal. It was not pretty. This was not the weak, comparatively speaking, heroin someone would needle. It was STRONG. It was smoked or ‘snorted’ up the nose. Intravenous use of this drug would have been almost instantly fatal. Tremendous quantity of the drug was consumed by these horrifically addicted men. Vung Tau could not be easily supplied with heroin on demand, without some serious interruptions, in the large quantities required to maintain the habits of hundreds of badly addicted soldiers by Viet Cong or North Vietnamese agents. The location was separated from the mainland by bracken marsh, accessed by a single causeway secured in multiple sectors with tightly controlled traffic having to pass American and Australian security checks. By sea would have been more likely, but here it is also problematic for the un-interrupted enemy supply of our soldiers with drugs. Vung Tau was highly secured by sea with armed patrol boats because of the high military value of its mission. It is a small area of land with essentially little coastline to secure. Security was tight. Interdiction would have been a near certainty, at least once in a while. It didn’t happen. The Viet Cong or North Vietnamese agents of course did not have air access to us. The CIA did. It was nowhere near rocket science to note the CIA airline Air America flight that parked 1/4 mile away from every other aircraft, never came in to parking area. 3 people, armed, stayed with the aircraft, command staff car picked up 2 others. Luggage (nearly modern steamer trunks filled with not only heroin but also high grade marijuana) for at least 10 (TEN) people was picked up by a 3/4 ton truck, with 2 persons riding with the baggage, 1 left guarding the aircraft. All airfield personnel were strictly instructed NEVER to approach the Air America flights. They never stayed more than several hours. Bingo, heroin flush by that evening. Again and again. Every time the soldier’s suppliers had run out of heroin, there was an Air America flight landed. Problem solved, the addicted soldiers were functional again. After Vietnam I served with 19th Special Forces Group as (11F40) Sergeant for Operations and Intelligence, working together with some of the best in the field, a position that eventually pointed to my later career as an investigator. In conversation with special forces veterans of CIA liaised Indochina operations, it became clear CIA narcotics trafficking in Vietnam was not a ‘one off’ by some isolated or small rogue element. I continued to follow the CIA in the available sources and have made some assessments, drawn some conclusions. The covert, operational or ‘black ops’ sector itself of the CIA has been the source of major narco-trafficking or, there has been a large and well organized rogue element within this sector where oversight is problematic. These people are in major international drug trafficking and their worldwide tracks are beginning to emerge over time, with overwhelming circumstantial evidence. After Vietnam, and the loss of direct military backing in force for our covert agency and no longer in control of the necessary areas in the region, heroin waned and cocaine became big. One only has to look at the tracks of the graduates of the School of the Americas, and connect the dots. This is the CIA associated initial source of the leadership training that has today’s Mexican Federal Police sometimes overwhelmed in pitched battles with drug lord militiamen that are now days professional commandos. Move south from there and you had Noriega in Panama, same source of training and a CIA asset, became a major international narco-trafficker. And now Mexico is severing its relationship with the CIA having anything to do with the so-called ‘war on drugs’ and it is a smart move (when considering the Pentagon has enlisted Blackwater as a contractor in the business.) Meanwhile the ‘war on drugs’ discovers the Rick Perry administration in the George W Bush home state of Texas moves very quickly to shut down investigators who’d discovered high powered American judges, politicians and law enforcement at parties thrown by drug cartels. Couple this to a joint Blackwater/CIA covert assassination program that had been run by known cartel killer Enrique Prado, coupled to Erik Prince’s known religious extremism with ties to and funding of the American religious right, one may more than speculate international narcotics trafficking is funding Rick Perry’s Islamophobic Tea Party. And Bush appointed Robert Mueller’s FBI? NOT INTERESTED, Small wonder with Mueller having been at the center of damage control and cover-up of the Iran-Contra linked BCCI terror and narcotics money laundering scandal. This is reinforced when Attorney General Eric Holder had concealed religious-right big shot Carl Lindner‘s contributions to the Uribe linked AUC death squads in Colombia. The CIA trafficking in Latin America is the most well documented, on account of the Iran-Contra affair having spilled into the open. And it is here we come up with the Bush family criminal syndicate who’s who of international narcotics traffickers .. oh and that ties into George H.W. Bush’s close buddy Bill Clinton, the business is a bi-partisan bag of maggots. Blackwater, who the Pentagon had farmed out the ‘war on drugs’ in Mexico to, is identified as an extension of the CIA. Meanwhile, Blackwater’s military contractor aviation had become a multi-hundred million dollar business. The now known operation coordinated by Furlong employed International Media Ventures, run by veterans of General McChrystal’s Special Operations forces, American International Security, run by a former Green Beret, and most interestingly, as we have seen, a company belonging to Duane ‘Dewey’ Clarridge, a former top CIA official with close ties to Robert Gates and Iran-Contra, as well utilized by the FBI in Afghanistan. Gates waited well over a month to “open an inquiry” to see whether “rules were violated” (notice contract murder is suddenly a mere ‘rules violation.’) With reports across the globe shouting bloody murder at the trouble he was in, Furlong appears never to have been prosecuted. Where had the Furlong/Clarridge operation been based and run out of? Almost certainly from the government protected Afghan drug lord (and presidential brother) Walid Karzai’s CIA rented compound outside Kandahar. The Clarridge operation is most certainly a cover for heroin trafficking. After, (video, above) the Russians’ high visibility whistle-blowing, there is grudging (and minimal) actions by the USA, busting just a few labs out of hundreds and ONLY those labs it would seem are not under the CIA’s protection. The southwest of Afghanistan is the poppy region where the USA military had taken a ‘hands off’ attitude and done little to nothing to address the problem. 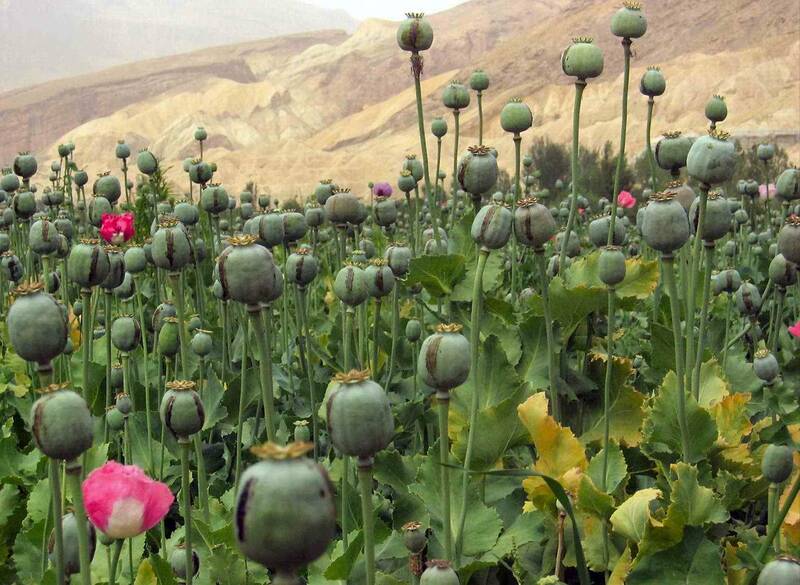 Any drug interdiction program efforts had been initiated against only THOSE OPUIM FARMERS WHO DO BUSINESS WITH THE TALIBAN, or 15% of the labs and traffickers. As the USA winds down the American military involvement, it is clear the problem had never been honestly addressed. Meanwhile, a British ambassador had been sent packing for investigating the problem from neighboring Uzbekistan and subsequently pens an article “Britain is Protecting the Biggest Heroin Crop of All Time.” It is interesting to note his linking a murdered former Russian anti-corruption investigator, Alexander Letvnenko working for MI6, had uncovered the Afghan heroin pipeline to St Petersburg… a crime blamed in popular media on Russia with no mention whatsoever of his connections in this regard. Litvenenko’s fatal mistake likely had been to concurrently cooperate with Spanish authorities on Russian mafia, bringing him too close to his expertise on the Afghan heroin pipelines. That MI6 may have been the actual perpetrator of Litvenenko’s murder is almost a certainty, with MI6 now also having been identified as piling ‘off the record’ cash to the government of Karzai and its known close connections to heroin trafficking. In the end, it come down to western complicity in the Afghan heroin trade is old news. Criminals do not voluntarily surrender their business models. Cleaning up the problem is not going to happen until the CIA covert operations is brought under control. The CIA, or a rogue element within the organization has been, personally enriching themselves for decades as international narco-traffickers, my assessment. All the while using our nation’s ‘Security’ together with all of the power of the apparatus the term implies, to cover a rogue and criminal club within our ranks. And so, another example of how it is the pursuit of violence through wars corrupts and/or attracts corrupt people. C’est la vie. An interesting aside, General Patraeus figures into the Latin America/Iran-Contra era, when he supervised his friend and professional associate from the CIA ‘Dirty Wars’ days, death squad veteran James Steele, when running covert torture centers in Iraq. Sep 11th, 2009 | WASHINGTON — A federal judge says the CIA is hiding behind dubious national security arguments to shield itself from a potentially embarrassing lawsuit U.S. District Judge Royce Lamberth, who earlier ruled that CIA officials committed fraud to protect a former covert agent accused in the suit, has rejected an emergency request to put the case on hold while the government appeals. The CIA has argued that allowing the case to proceed would divulge classified information, but, in an opinion made public on Friday, Lamberth said there was no good reason to delay. The case has been a test of the Obama administration’s use of the so-called state secrets privilege, when the government seeks to block legal action by saying the details that would be revealed would harm national security. In the DEA case, Lamberth has previously rejected the state secrets claim. Government lawyers are attempting to reassert the privilege but on different grounds, but the judge isn’t buying it. “Having lost on their assertion of the state secrets privilege, the government’s new refrain is heads you lose, tails we win,” the judge wrote. Horn claims Arthur Brown, the former CIA station chief in Burma, and Franklin Huddle Jr., the chief of mission at the U.S. Embassy in Burma, were trying to get him relocated because they disagreed with his work with Burmese officials on the country’s drug trade. The proposed settlement followed a ruling by U.S. District Judge Royce Lamberth in July that CIA officials committed fraud to protect a former covert agent against the eavesdropping allegations. The lawsuit was brought by former DEA agent Richard Horn, who says his home in Rangoon, Burma, was illegally wiretapped by the CIA in 1993. He says Arthur Brown, the former CIA station chief in Burma, and Franklin Huddle Jr., the chief of mission at the U.S. Embassy in Burma, were trying to get him transferred because they disagreed with his work with Burmese officials on the country’s drug trade. Horn sued Brown and Huddle in 1994, seeking monetary damages for violating his civil rights. The CIA itself was a defendant in the lawsuit until early this year…..
Then-CIA Director George Tenet filed an affidavit asking that the case against Brown be dismissed because he was a covert agent whose identity was a state secret that must not be revealed in open court. Lamberth granted the CIA’s request and threw out the case against Brown in 2004. Lamberth found out last year that Brown’s cover had been lifted in 2002, even though the CIA continued to file legal documents saying his status was covert. The judge found that the CIA intentionally misled the court and he reinstated the case against Brown. WASHINGTON — Ahmed Wali Karzai, the brother of the president of Afghanistan, gets regular payments from the CIA and has for much of the past eight years, The New York Times reported Tuesday. The newspaper said that according to current and former American officials, the CIA pays Karzai for a variety of services, including helping to recruit an Afghan paramilitary force that operates at the CIA’s direction in and around Kandahar. Critics say the ties with Karzai complicate the United States’ increasingly tense relationship with his older brother, President Hamid Karzai. The CIA’s practices also suggest that the United States is not doing everything in its power to stamp out the lucrative Afghan drug trade, a major source of revenue for the Taliban. Some American officials argue that the reliance on Ahmed Wali Karzai, a central figure in the south of the country where the Taliban is dominant, undermines the U.S. push to develop an effective central government that can maintain law and order and eventually allow the United States to withdraw. “If we are going to conduct a population-centric strategy in Afghanistan, and we are perceived as backing thugs, then we are just undermining ourselves,” Maj. Gen. Michael T. Flynn, the senior American military intelligence official in Afghanistan, was quoted by the Times in an article published on its Web site. Ahmed Wali Karzai told the Times that he cooperates with American civilian and military officials but does not engage in the drug trade and does not receive payments from the CIA. Karzai helps the CIA operate a paramilitary group, the Kandahar Strike Force, that is used for raids against suspected insurgents and terrorists, according to several American officials. Karzai also is paid for allowing the CIA and American Special Operations troops to rent a large compound outside the city, which also is the base of the Kandahar Strike Force, the Times said. Karzai also helps the CIA communicate with and sometimes meet with Afghans loyal to the Taliban, the newspaper reported. CIA spokesman George Little declined to comment on the report. What Hamidi had pointed directly to, is military subcontractors in the employ of CIA, the military and the police, all in bed with both narcotics trafficking and the Taliban. Wali Karzai and Ghulam Haider Hamidi were both assassinated not long after, Wali Karzai because he was too ‘hot’ (his own CIA liaison killed him) and Ghulam Haider Hamidi because he was too clean ..
9 July 2015 update: Corresponding perfectly with the Department of Defense & CIA gaining control over the opium production in Afghanistan: “CDC health officials said that the US is in the grip of a heroin epidemic, with abuse of the drug doubling among 18-25 year olds, doubling for women, and rising among white people by 114 percent over a decade from 2002 to 2013.” Read the story at RT and see the facts posted at the Center for Disease Control. Seal worked directly for Sonia Atala, the CIA protected drug baron (Michael … that the Sandinistas were directly involved in drug trafficking into the United States. A Question of Torture: CIA Interrogation from the Cold War to the War on Terror … Paul DeRienzo: What was the CIA’s role in heroin trafficking in Southeast Asia? (2) David Corn, Dark Alliance: The CIA, the Contras, and the Crack Cocaine … the contra program who (were) alleged to have engaged in drug trafficking. Webb published Dark Alliance: The CIA, the Contras and the Crack Cocaine …. the contra program who (were) alleged to have engaged in drug trafficking. The two men told Sheehan about a group of former CIA agents and assets were … in a racketeering network involved in drug trafficking and arms smuggling. Carl Jenkins was also involved in AMWORLD, a CIA program to overthrow Fidel ….. jobs, and became obsessed with the covert world and drug–trafficking. (1) Fabian Escalante, The Secret War: CIA Covert Operations Against Cuba, …… go to prison for 18 months for a drug trafficking charge,” answers the general. According to David Corn (Blonde Ghost: Ted Shackley and the CIA Crusade) in 1985 …. jobs, and became obsessed with the covert world and drug–trafficking. … on subjects such as cross-border narcotics trafficking and monitoring violent …. is laid at the CIA’s feet, where it does not belong, every tree in the forest will fall. Thanks for this info. Have you read Douglas Valentine?